The Last Dragonslayer was one of my favorite reads in 2011, and I’m not just saying that because Jasper Fforde is my favorite author. I absolutely loved Jasper Fforde’s YA debut, and I thought it was a hilarious and smart read. Silly me, though, that I didn’t know there was going to be a sequel to this. It totally took me by surprise, but I’m not complaining. A new Jasper Fforde? Of course I want that! Jennifer Strange, the last dragonslayer in the Ununited Kingdom, is back, but she’s no longer the dragonslayer. She’s back to being the manager of Kazam, the magical placement industry where their sorcerers are hired to do various tasks in the kingdom for some moolah. The story opens with Jennifer, together with her apprentice Tiger Prawns, and the Kazam sorcerers, trying to find a missing ring for a whole wad of moolah. Jennifer thought this was good practice for their bridge building job due for the weekend, which could really put Kazam in the map. The job was a success, but it didn’t mean the bridge building gig was supposed to go smoothly. A magic license test later, Jennifer finds herself facing the possibility of Kazam being taken over by iMagic, their rival, arrested sorcerers, sorcerers turned to stone, and a prediction that the Great Zambini would return. For a while. And a Quarkbeast on the loose. The scene: Tiger Prawns has to go down the well to retrieve the missing ring, and he carries a ball that lights up when he’s being sarcastic and he has a toddler’s shoe around his neck as a communication device so he can talk to the ones outside of the well. Did that make sense now? I hope so. I know. It doesn’t make sense. But trust me, it’s hilarious. However. 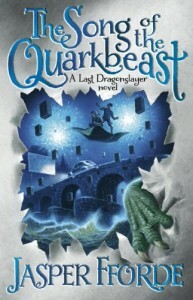 As fun and enjoyable The Song of the Quarkbeast was, it didn’t feel as engaging as the first book was. Yes, there’s the usual fun, usual chaos and all the crazy things that sprung from the endless imagination of Jasper Fforde…but it just felt like there could have been more. I never had a clear picture of the story up until I was 2/3 in. Which may have been done on purpose, now that I think of it. Which is still good, okay, but I think it just pales a bit in comparison to The Last Dragonslayer. Nevertheless, I still liked this. And of course I’m looking forward to the third book coming out this year, The Return of the Shandar. I still stand by what I said in my review for the previous book: if you’ve always thought of trying a Fforde but not sure where to start, or you feel intimidated with his adult books, then his Jennifer Strange books are a good ones to get your feet wet. Oh, and after reading this book, I want my own Transient Moose.